WIND, WATER and SUN salutation. Combine your windsurfing or kiteboarding holiday with yoga practice and return home in peak health. 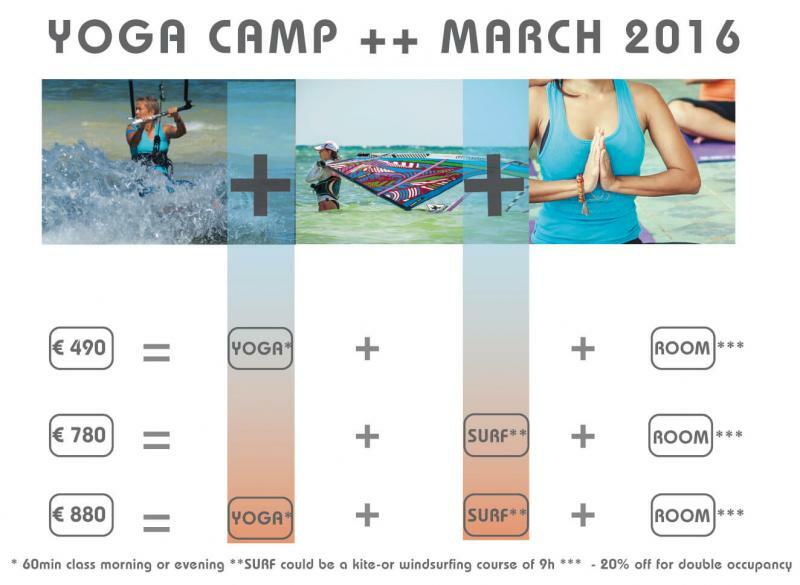 The next YOGA CAMP++ starts on the 12th of March 2016. The Camp is like a modular system so you can combine kiteboarding or windsurfing with daily yoga classes. All packages include accommodation in the unique Reef Retreat just 2 min walking distance from our station. Your breakfast will be served in Café Tabou at our surf school. We will arrange the windsurfing and kitesurfing lessons together with your instructor to suit other activities. This full package applies for 1 person and is valid for one week incl. accommodation in Reef Retreat, kite or windsurfing courses or rental, and daily Yoga classes. This is a perfect arrangement if you like to stay active the whole week of your holidays. You can choose between an 9h beginner kite or windsurf course including equipment for the entire week. All advanced kite and windsurfer can convert the 9h course to a full week equipment-rental. This offer is excluding Yoga classes. We welcome non watersports companions to join just the yoga-classes. You can choose between a morning and late afternoon class. If you want to visit both, please do not hesitate to show up! Previous knowledge in Yoga is not necessary! Start 8:00: We start the day with a dynamic Power-Yoga to awaken the body & mind and to activate your heart and blood circulation. Well prepared and warmed up we are ready for the first kite- or windsurf lesson and avoid any sore or pulled muscles. Let’s start the day! Start: 16:00 : After a long day on the water we are focusing on stretching and relaxation in our afternoon class. Specially chosen Yoga-poses should relieve stress and tension in all stiff muscles and calm down your mind. Ready for the sun-set? The yoga classes are taught in turn by 2 experienced Yoga- teachers. Simone has more than 10 years working as a windsurf and kitesurf instructor at Funboard Center Boracay and was always practicing Yoga as a great balance to kite-and windsurfing. Her passion as well as the benefits of this long period of practice are the reasons why she became a yoga-teacher. Simone will offer custom-made yoga-classes to prevent any shoulder- or back problems. Markus discovered the benefits of Yoga in 2000 along side the Tibetan healing movements, he received his teaching certificate in 2009 and since he has been teaching yoga on the island of Boracay. Markus combines perfectly matched yoga poses to a harmonious and flowing sequence of movements. Markus teaches the yoga classes Meditation in Motion. The finale of the Camp is the sunset cruise for the group around the island with traditional Philippine BBQ at White Beach. A sun-set dinner (exclusive) at Diniwid Beach, SUP-Excursion, Nature-day-trips or Island Hopping will make your stay perfect. If you want to get an idea what has happened before, just look at our FOTO SHOOTING during YOGA CAMP++ or YOGA CAMP++ No 2. Bookings can be made through this website. Island hopping for everyone - downwinder for intermediate kitesurfer! Photo album: CAMP No 5 - more than kiteboarding and windsurfing!